The ambience at Rathsallagh House in Dunlavin, County Wicklow, Ireland is warm and inviting, and Head Chef John Kostuik's cuisine is in perfect harmony. The attractive dining room has gleaming wood paneled walls with sconces adorned with small shades, windows and French doors that open to the outside are framed with floor-length beige striped draperies and tasseled ties, there are interesting paintings on the walls and over the fireplace, a large bouquet of flowers on a small table in the center of the room, and classical music plays in the background. Red and gold print upholstered wood chairs, pristine white print-on-print linens and white napkins adorn the tables set with Villeroy & Boch china, Newbridge silver cutlery, sparkling crystal, glass bowls artfully arranged with mixed flowers of Bachelor Buttons, tiny daisies, sweat peas, and greenery, tea lights in small holders, and floating candles in glass bowls set on the wide windowsills complete the elegant ambience. Edward F. Nesta and I stayed at Rathsallagh House in September 2007, and had two enchanting dinners at the Rathsallagh House Restaurant. Executive Head Chef John Kostuik began our first evening by sending us an Amuse Bouche of a hard-boiled quail egg that was deep-fried and served with an herb oil pool and red pimento and chive garnish. For Edward's first course, he selected the Szechuan Barbecued Spatchcock of Quail with Asian Coleslaw and Ginger Syrup, which was artistically presented, practically melted in the mouth, and offered a nice balance and contrast of flavors. I selected the Organic Salad Leaves with Buffalo Mozzarella, Bosses Tomatoes, and Toasted Almonds. I learned that Rathsallagh House grows their own vegetables, herbs, and other produce in their gardens, and that Bosses Tomatoes referred to their homegrown tomatoes, which I never refuse. We continued with bowls of Roast Corn Soup garnished with parsley and drizzled with herb oil, that were delicious reminders of the still lingering warm days of summer, combining creaminess with bits of corn to add texture. For his third course, Edward selected the Roast Fillet of Milk Fed Veal with its Sweetbreads, Shallot Purée and Wild Mushroom Tuile. Presented with caramelized cauliflower and a mélange of wild mushrooms, this was another beautifully prepared course. I always like to try new things, and when I saw the Citrus and Fennel Roasted Cod Fillet with Sautéed Samphire and Lebanese Couscous, I wanted to try it, as I had no idea what Samphire was, and learned that samphire is a wild herb that it is also called sea fennel. The cod was presented with a crown of samphire, and I really enjoyed the earthiness and unusual texture of the samphire, which added a pleasant contrast to the sweet-tartness of the citrus. After experiencing the savory side of Rathsallagh House Restaurant, it was time to experience the sweeter side. Edward selected the Garden Black Currant Parfait with Chocolate Jelly presented as a scoop of black current ice cream with two squares of chocolate jelly on either side. Ice Cream is a passion of mine, and I had the Palette of Homemade Sorbet presented as a cookie palette with a scoop of coconut sorbet with a triangle cookie "beret" and raspberry and orange sauces "painted" on the plate. We ended a perfect evening with a Bushmills Irish Whiskey neat for Edward, and a Grand Marnier for me. The following evening was Edward's birthday and we began our celebration with having pre-dinner drinks in the drawing room. Relaxing in front of the cozy fireplace with a glass of Red Breast 12 year old for Edward and a glass of the Irishman Superior for me, perusing the menu while enjoying our drinks, was an excellent way to commence his birthday celebration. Rathsallagh House changes the menu nightly, which is not printed until 5:00 pm, since the menu is determined by availability of the local fish, game, and produce, and we were eager to see what new selections were on the menu. Seated at "our" table in the dining room, Chef John Kostuik sent us an Amuse Bouche of salmon with tiny, diced vegetables to begin our dining experience and tempt our appetites. 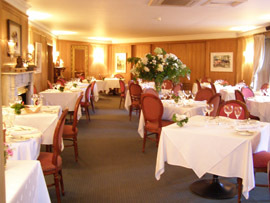 The restaurant has two smokers and smokes their own fish and meat, which Edward had seen earlier in the day when talking to Chef John, and selected the Warm Fillet of House Smoked Mackerel with Pickled Garden Cucumber and Rye Toast for his first course, which was an ample portion of delectable smoked mackerel. I selected the Pan Seared Duncannon Scallops with Garden Tomatoes and Aged Balsamic, which was presented as crispy exterior scallops surrounding a mound of mixed greens and tomatoes and drizzled with an ample portion of aged balsamic. For his second course, Edward selected the Garden Courgette and Thyme Soup, and I had the Orange and Cardamom Sorbet served in a demitasse, which was an interesting meld of flavors with a lingering cardamom finish. Edward really enjoys duck and was overjoyed to find that Chef John had included a Peach Infused Magret and Confit Leg of Duck with Soft Polenta and Garden Elderberry Jus on the evening menu. Presented with grilled peaches, and paired with a Fleurie, Domaine du Point du Jour 2005, with an aromatic nose of fruit and spice, and rich red berries, spice, and earthiness on the palate, this was a wonderful course. I continued with John Dory Lightly Poached in Olive Oil and Tarragon with Orzo Pasta, Pea Purée, and Garden Turnips that Chef John had cooked in a Gastrovac, which cooks at a very low temperature and cooks fish perfectly. The delicate flavor of the fish really came through in this course. As a special surprise for Edward, I had requested a cake for his birthday. Chef John along with his team of Sous Chefs Susan Bowker and Eric Kavanaugh created a rich chocolate cake with chocolate fondant with Happy Birthday written on it and bordered with raspberries. Arriving at the table with a lit candle and accompanied with strawberries and half a passionfruit, Edward loved his birthday surprise. His wish? He did not tell me, but I would not be surprised if it included another trip to Ireland and Rathsallagh House. Read other articles on Rathsallagh House in the Hotels and Resorts, Adventures, and Chefs' Recipes sections where Executive Head Chef John Kostuik provides an extensive selection of his recipes. Please read other articles on Ireland in the Destinations, Hotels and Resorts, Restaurants, Chefs' Recipes, Spas, Liquor Cabinet: Celtic Crossing Liqueur, Boru Vodka, Knappogue Castle Irish Whiskey, Fashion, and Adventures sections. © January 2008. Luxury Experience. wwwLuxuryExperience.com All rights reserved.